City Council President Rey Garduño and City Councilor Diane Gibson are honored to attend a vigil honoring the memory of Lilly Garcia and honoring our brave APD Officer Daniel Webster, who was shot in the line of duty. 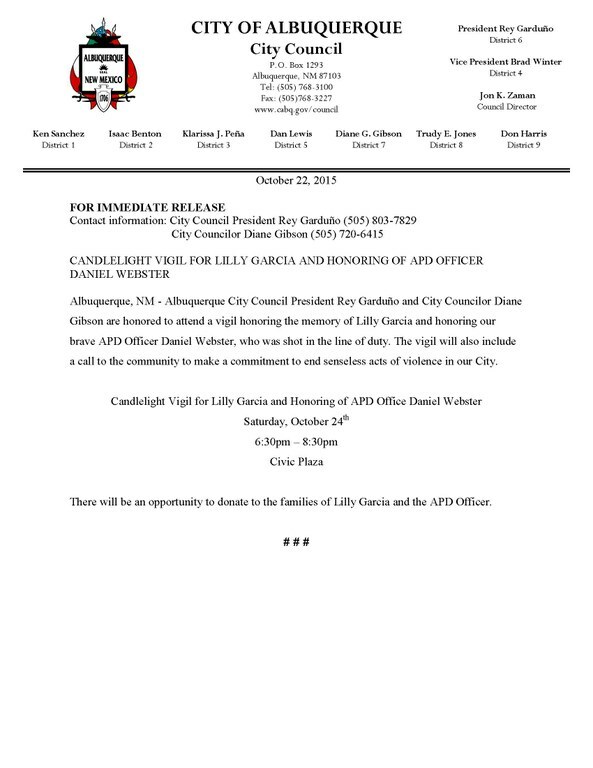 The vigil will also include a call to the community to make a commitment to end senseless acts of violence in our City.City Council President Rey Garduño and City Councilor Diane Gibson are honored to attend a vigil honoring the memory of Lilly Garcia and honoring our brave APD Officer Daniel Webster, who was shot in the line of duty. 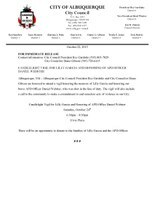 The vigil will also include a call to the community to make a commitment to end senseless acts of violence in our City. There will be an opportunity to donate to the families of Lilly Garcia and the APD Officer.There will be an opportunity to donate to the families of Lilly Garcia and the APD Officer.